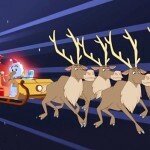 The BBC has published information on its Christmas lineup of programmes for children, across the CBBC and CBeebies channels. Brief details below, with links to more detailed information. Please check back regularly, as initial information often excludes vital details such as the broadcast date and time. It’s Christmas in Scarborough. After running up a huge bill downloading movies on his Mum’s phone, Charlie (Ryan Wilkinson) is keen to make some money back so he can give his family the celebration they deserve. It’s Christmas! And Danger Mouse (Alexander Armstrong) and Penfold (Kevin Eldon) are tasked with protecting Santa Claus from the villainous clutches of the festive season destroying Snowman. It’s Christmas in Bogmoor, the most wonderful time of the year…or at least it’s supposed to be. In all the excitement though, Gabe kind of ruins Christmas and decides it’s time to leave again! But what would life be in Bogmoor if Gabe (played by Niall Wright) wasn’t around? The ghost of Christmas past presents Gabe with some home truths. There’s a big surprise for Mark in the ‘Junior Bake Off’ sting, a Star Wars fan gets a festive surprise and after Weekend Wind Down you’ll never look at your Christmas dinner in the same way again! With lots of games and laughs, almost anything could happen in this as-live show. Cook and Line are hoping to be good enough pirates to deserve a Christmas present, but when they accidentally drop Sinker’s snow globe into the Ships Mess, they have to come up with a clever idea to give the Captain the ‘cold and snowy’ Christmas she wants.